On Saturday, PlayStation VR pre-orders began at Japanese retail shops. The VR headset won’t be out until this October, but if the lines are any indication, Sony could have a hit on its hands. 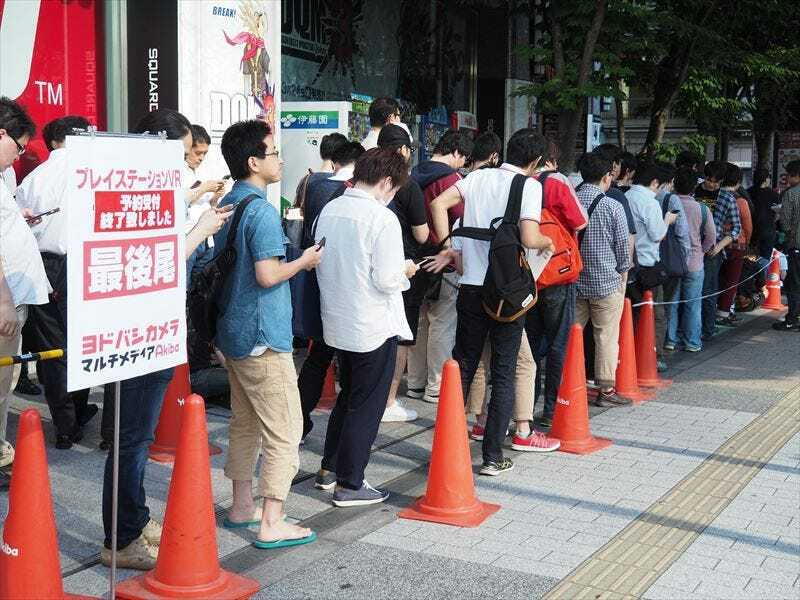 According to the Mainichi News, one of Japan’s biggest newspapers, around five hundred people waited for pre-orders at the Yodobashi Camera in Tokyo’s Akihabara (website ASCII took the above image at said store in Akihabara). It’s no surprise that Tokyo seems to have had the longest lines, but hundreds of people also lined up for the PlayStation VR in Osaka. Even by 10pm on Friday night, there were already approximately 50 people lined up at the Yodobashi Camera in Akihabara. Here’s the Yodobashi Camera in Tokyo’s Shinjuku at 12:30am. Same shop. This was at around 1am. That same shop ended pre-orders at around 1:20am after enough people showed up to claim all the allotted units. This is close to 2am this past Saturday at the Yamada Denki shop in Ikebukuro. The shop was apparently only getting 280 PSVR units and there were already seven or so people camping out. Many more people, however, showed up later. This was taken at the Yodobashi Akihabara shop at around 5:30am. It seems there were about 150 people or so waiting. Meanwhile, in Osaka, there were around 30 people lined up in front of the Yodobashi Camera in Umeda. By morning, a sizeable line had formed. One estimate put the line at close to 300 people. It’s unclear if these are merely dedicated VR fans, those keen to play the PSVR’s more niche experiences, or a sign of things to come among Japan’s general gaming population. But so far, so good, I guess.